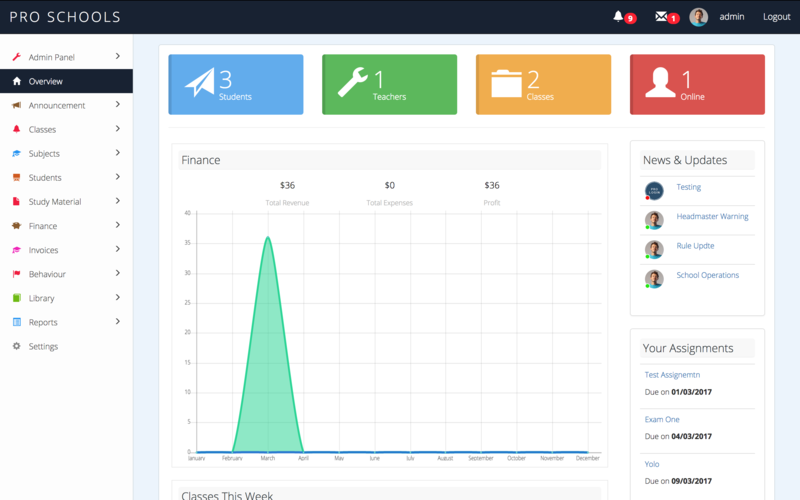 Pro School – PHP School Management System is a powerful PHP script designed to allow you to build a school system from scratch. 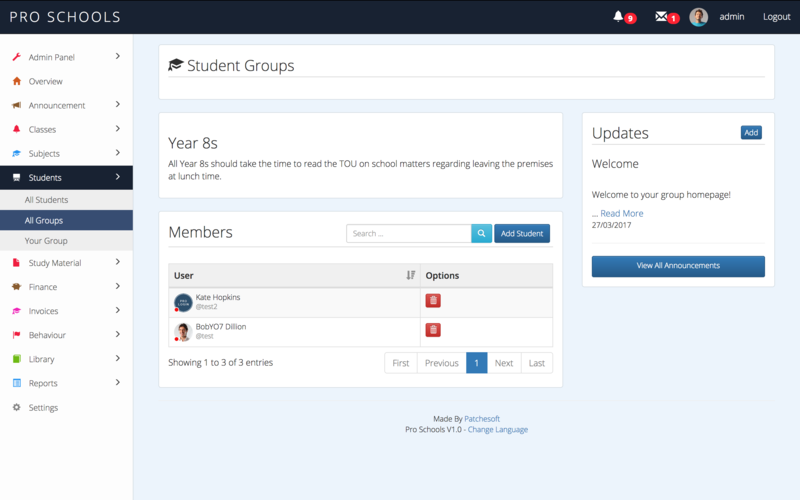 Manage Students and Teachers, create Classes and Assignments, update Timetables and Attendance and lots more! It’s powered by MySQL and PHP. DEMO DATE resets every 30 minutes. Pro School is also very secure! Built using the latest CodeIgniter Framework Version 3.0+ that has been tried and tested by millions of developers. Don’t want to deal with the hassle of setting the system up? Check out our Services page for more details. 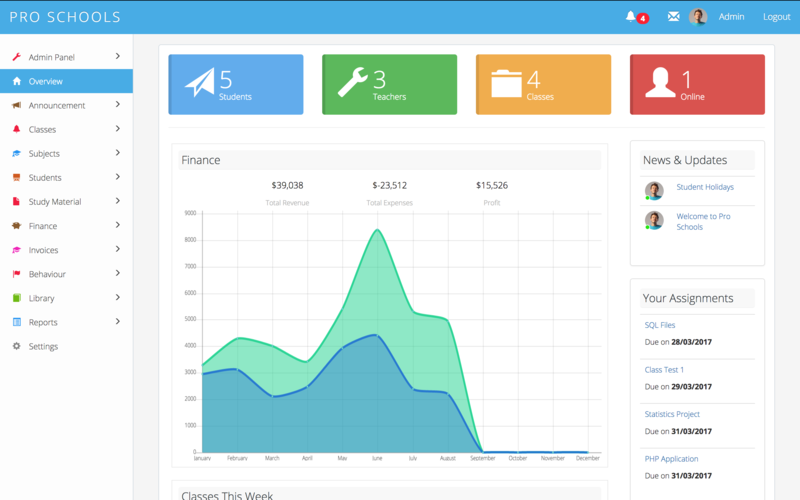 Create unlimited amount of classes for your School. 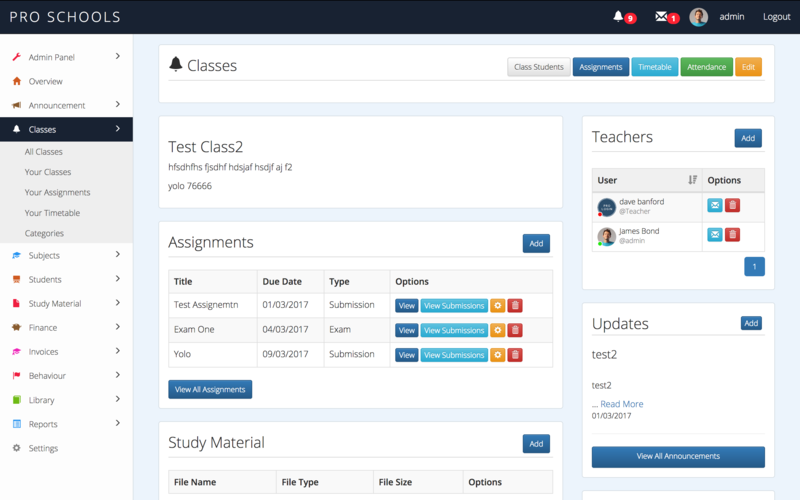 Each Class can have assignments, timetables, attendance, announcements, study files, library books and more assigned to it. Classes can have students and teachers added to them. 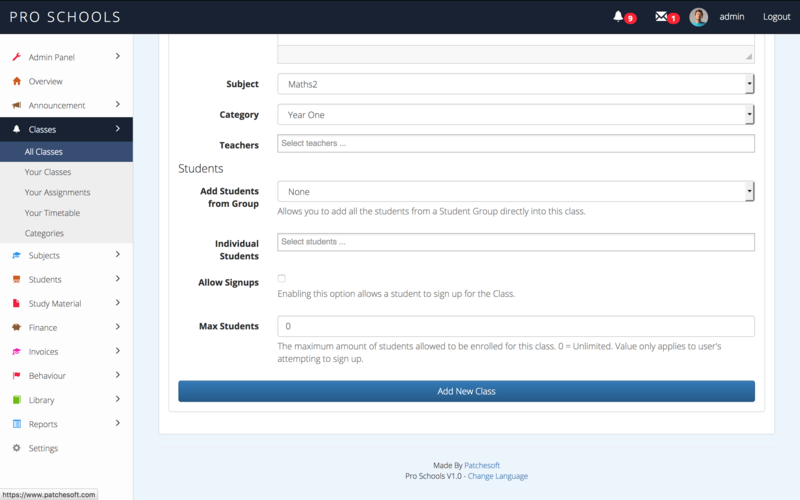 Allow Students to sign up to classes. Limit the amount of sign ups. 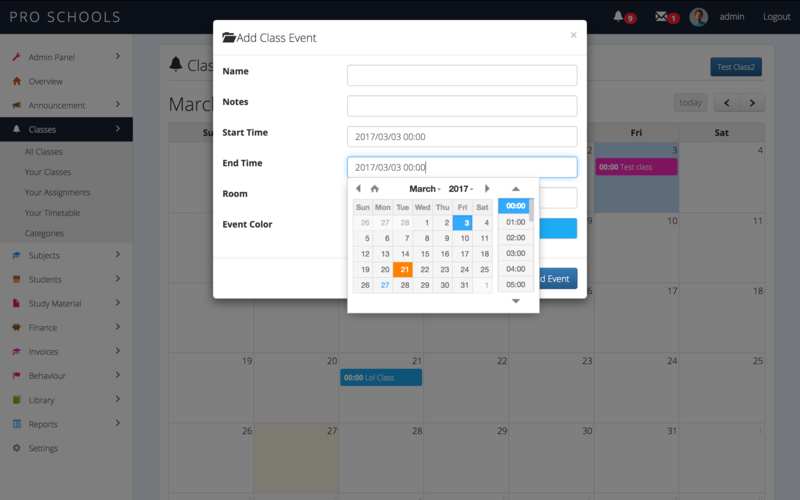 Add Timetable events so your students know when the next class is. 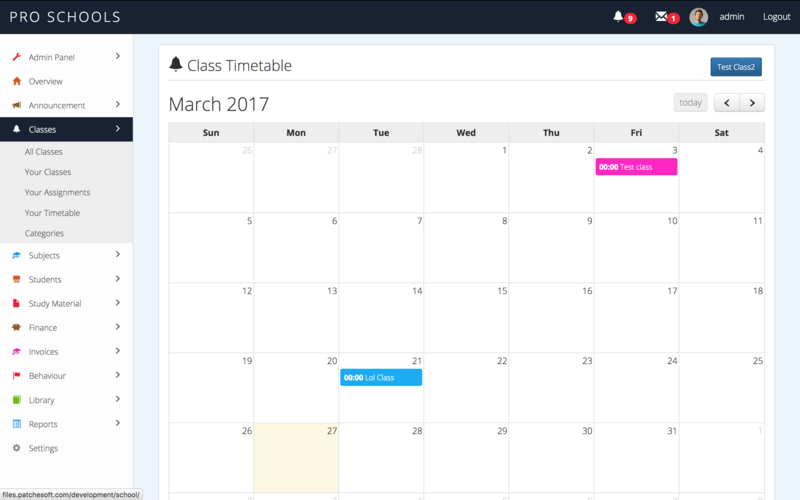 User can view all events for all the classes they have signed up for in the Your Timetable section. User can view all their assignments for all classes they have signed up for. 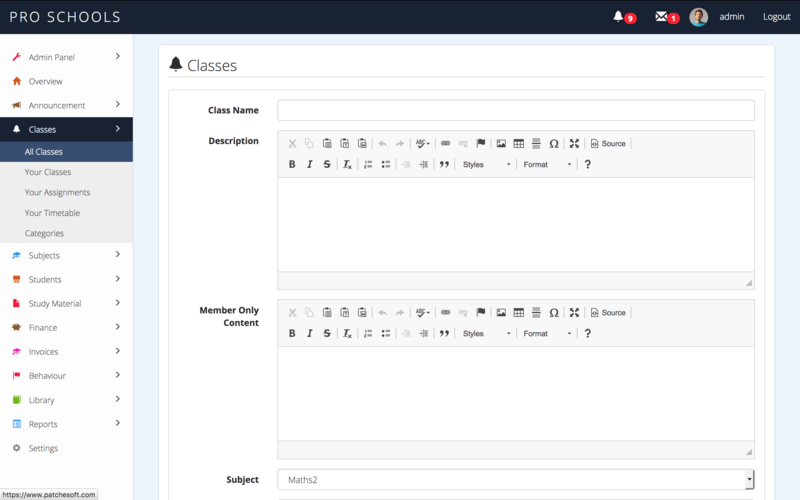 Class Manager can add new students and teachers to the Class. Teacher of the class can post announcements to that class. See which students have read them. Assign library books and study files to the Class for easy access. 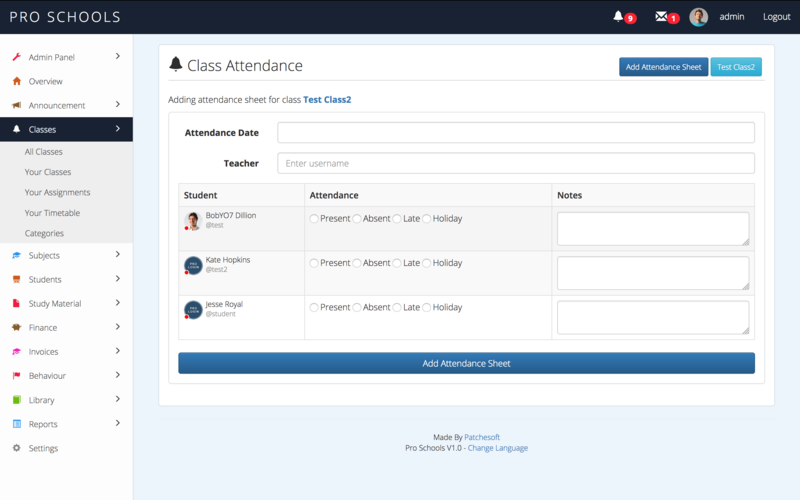 Class Attendance allows you to submit attendance reports of every user in the class. Assignments can be of two types: exam or submission. 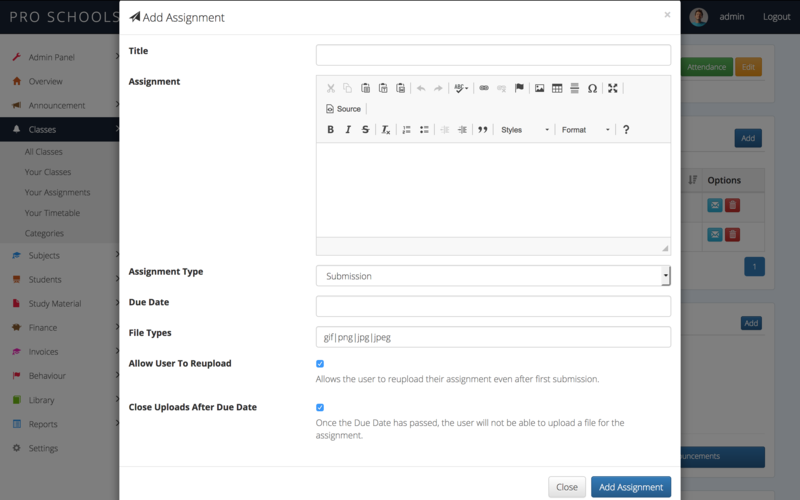 Submission assignments allow the user to upload a file before a deadline. Teacher can view all submissions and grade them. 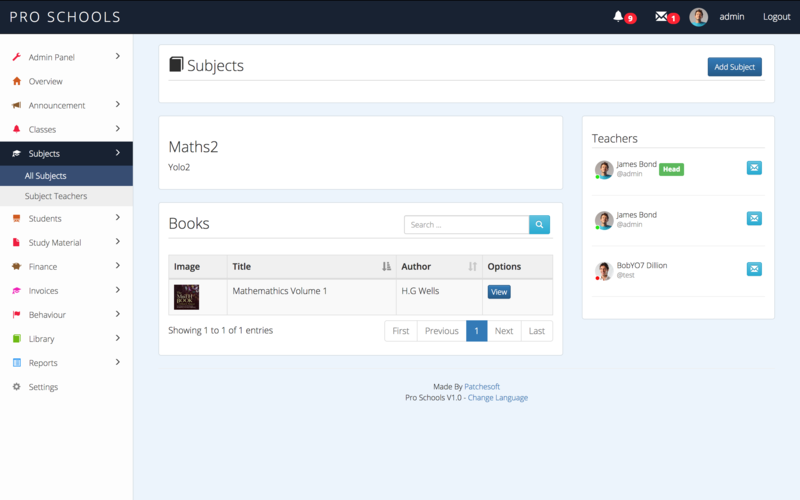 Add subjects and assign teachers to the subjects. Add unqiue grading system for each class. Specify the weighting of each assignment. Create rooms for each hostel, specify price, capacity and room type. Create bookings for each hostel room. 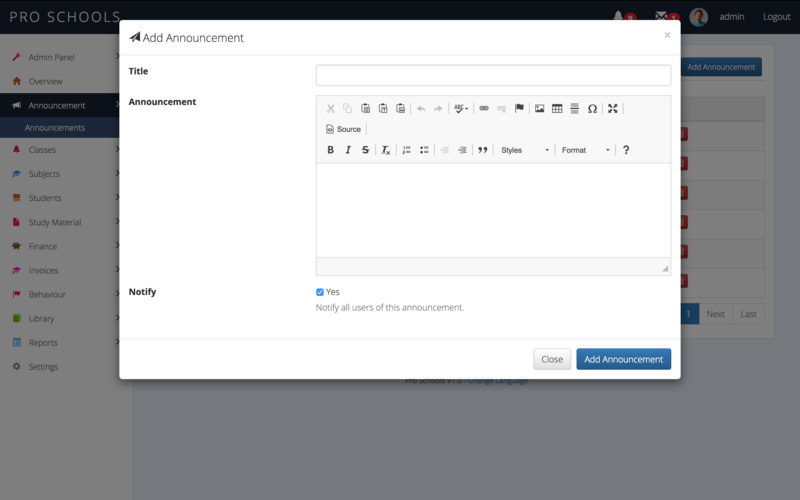 Global school announcements can be posted by staff that notify the whole school. Global announcements are displayed on the frontpage. 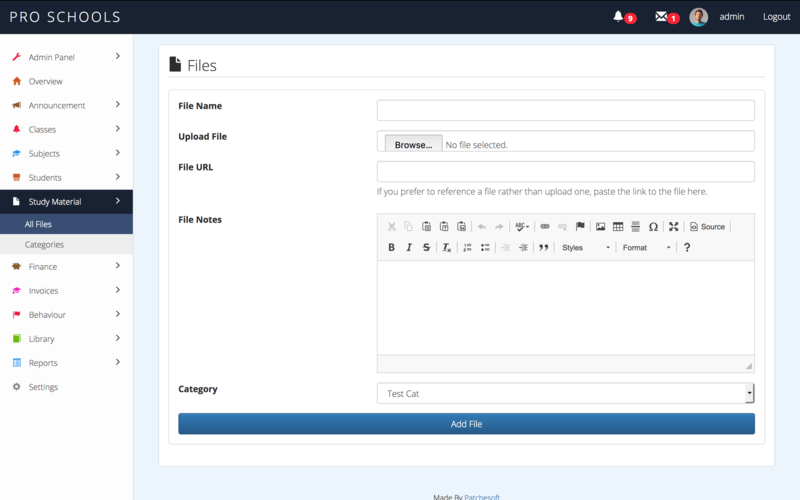 File System which allows you to upload files to the site that Students can then download. Specified the allowed file types in the Admin Panel. Organise your files into categories. Files can be added to Classes for easy access. 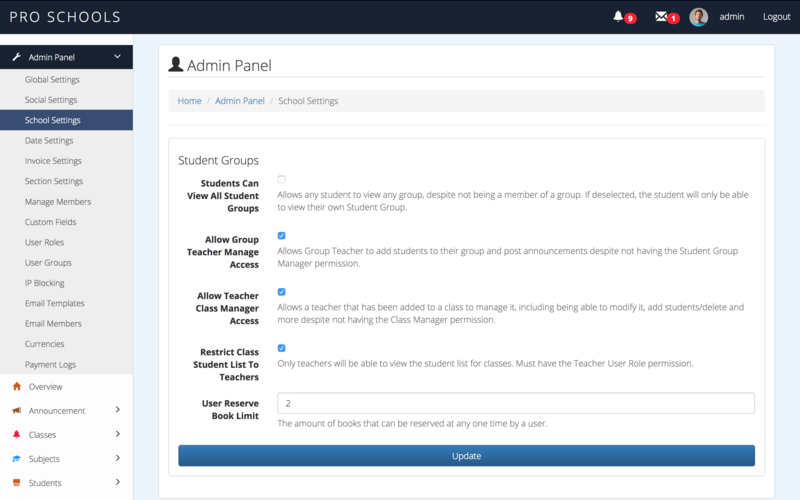 Custom User Roles allows you to specify what permissions your Students have. 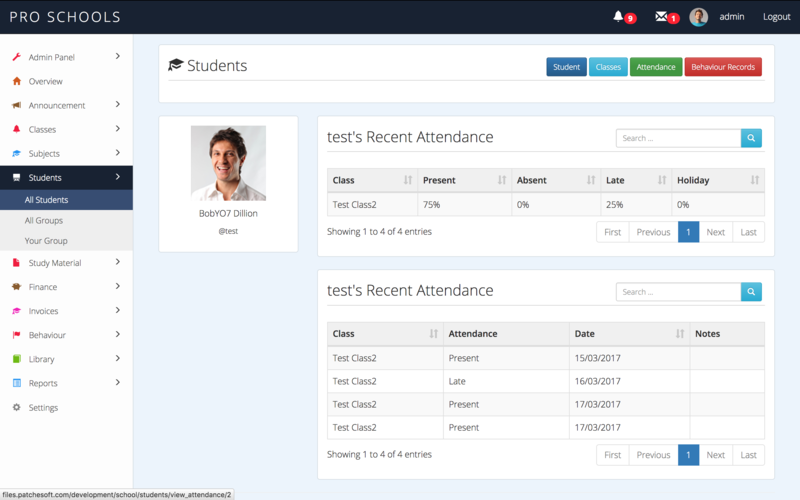 Students can be managed by Teachers, including viewing all their classes, attendance and behaviour records. Student Groups allow you to group your students together. Student Groups have their own page where the teacher can post announcements. Restrict access to who can view which Student Groups. School Report shows student’s grades and attendance for each class. Download School Report as PDF. Parents can have children assigned to them. Parents can view all the details of their children, including classes, attendance, behaviour reports and school reports. 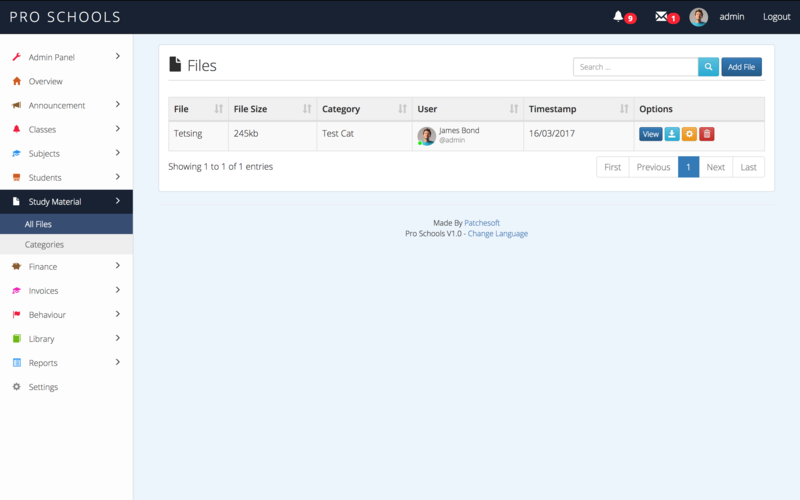 Parent Manager User Role allows the user to manage parents. User roles allow you to give permissions to specific users. 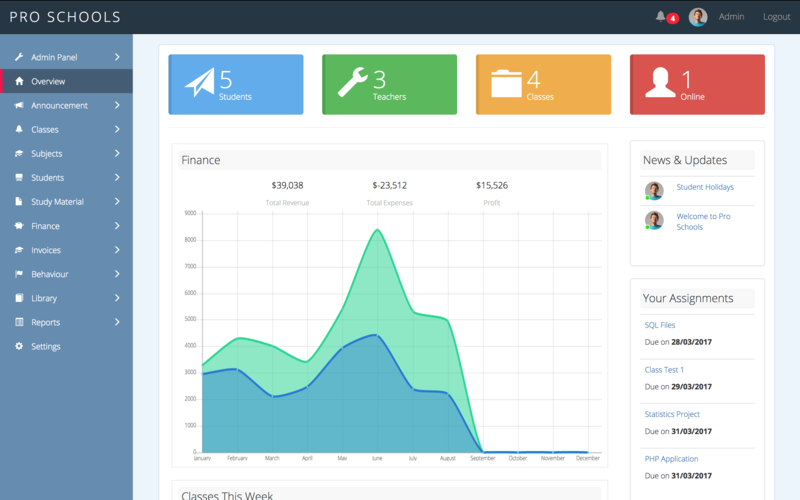 Dashboard produces beautiful graph of your years finances. Add Rules that you can record records of. 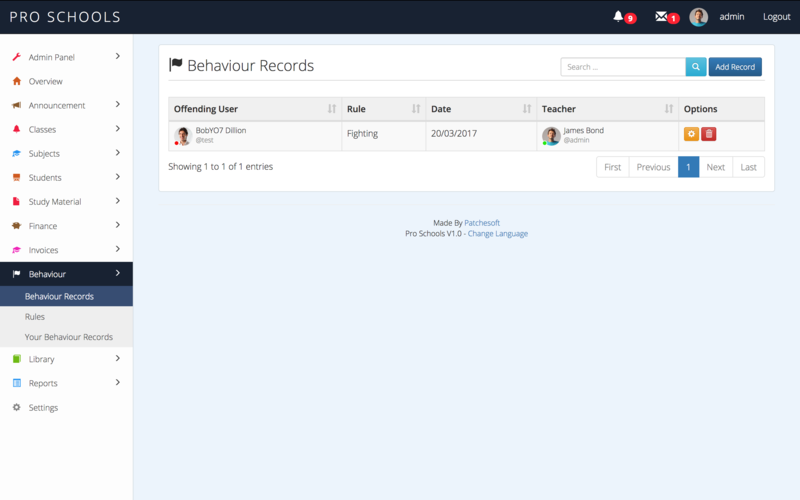 Behaviour Records allow you to record incidents of rule breaking for students. Assign students to records, including date and incident report. View a user’s behaviour records in the View Students section. 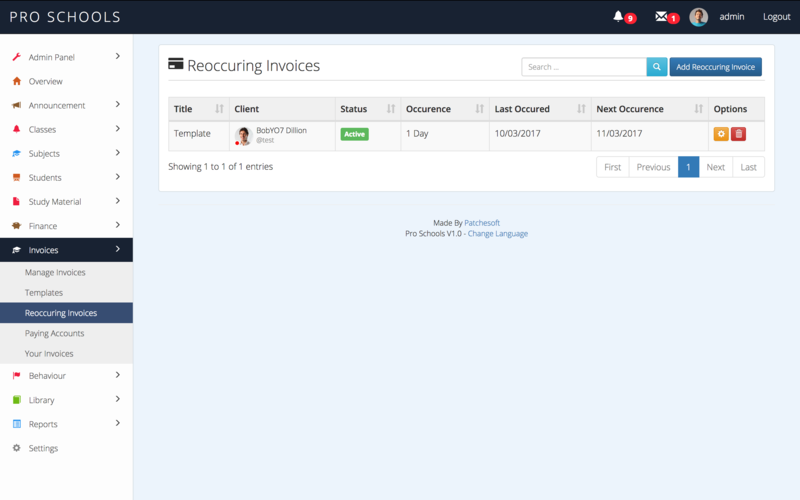 Automatically set Invoice to paid by using PayPal’s IPN system, Stripe’s API or 2Checkouts API. 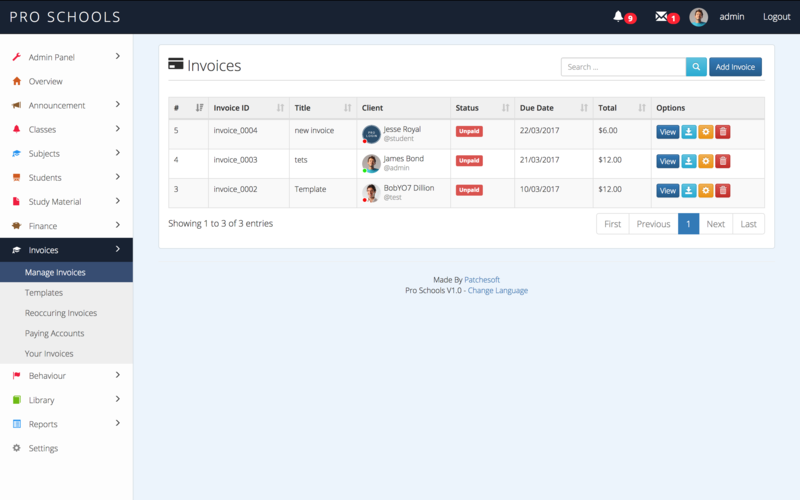 View Web Version of Invoices to send to clients/students. 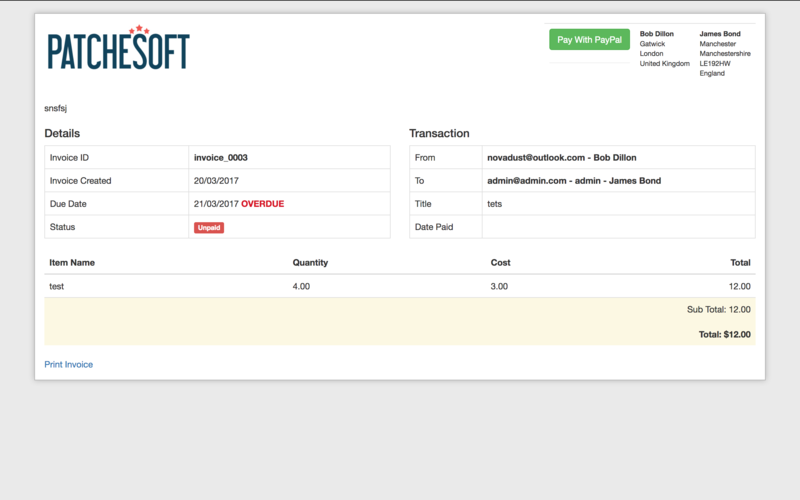 Create Paying Accounts that allow you to specify API keys for payment gateways. Add unlimited books to your Library system. Allow students to reserve books. Allow Librarian/Teacher to checkout books for students. 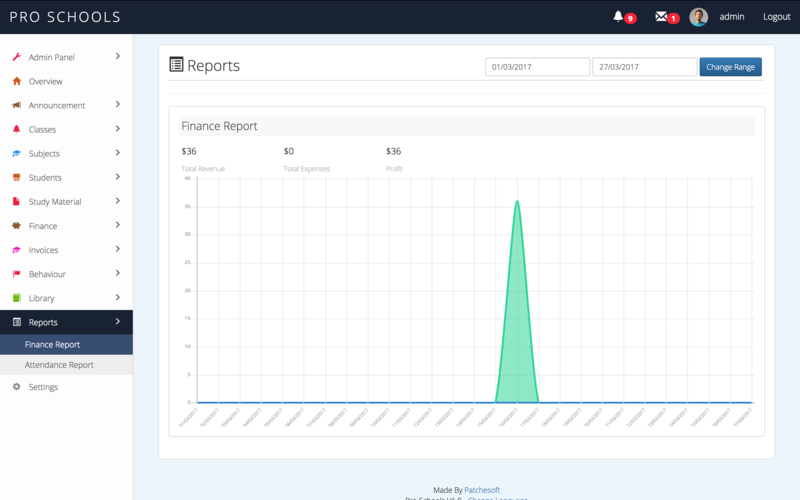 View Financial Reports between specified date ranges. 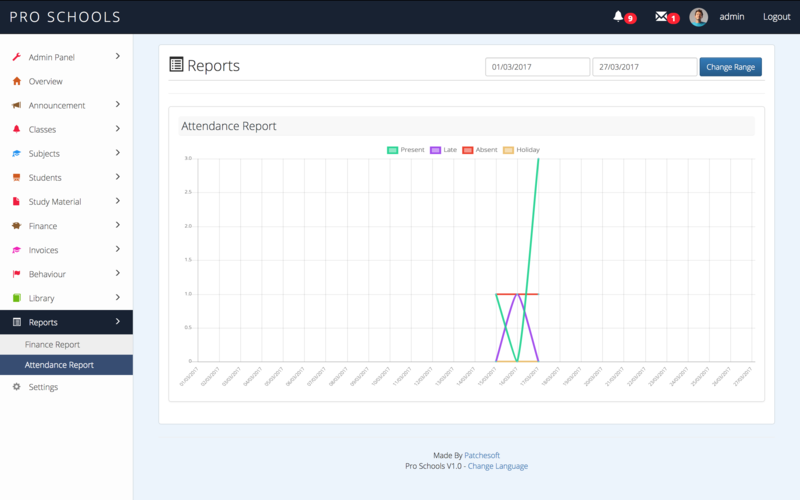 View Attendance Reports between specified date ranges. View all your messages in a beautiful designed inbox. Get notifications when you recieve new messages. Admins have access to all sections of the site. Create User Roles specifically for parents,students,teachers so they don’t see more than they need to. Section Settings allow you to disable various areas of the system. Date Settings allow you to change the way dates are displayed. 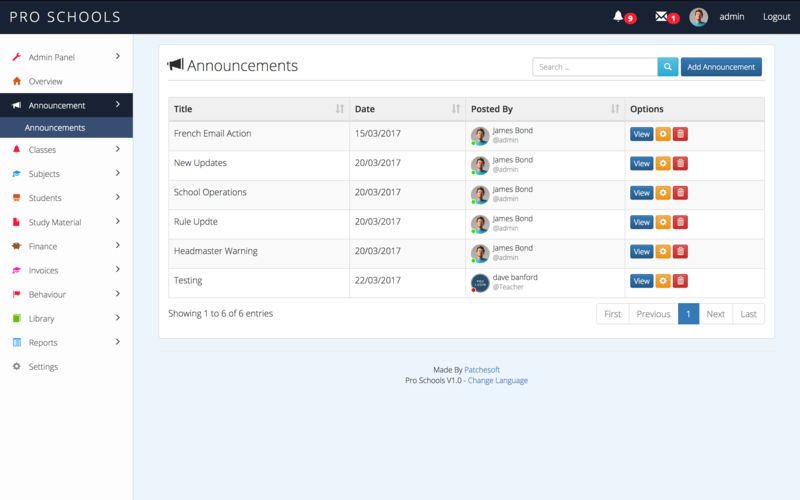 School Settings let you change the way certain aspects of your site work. 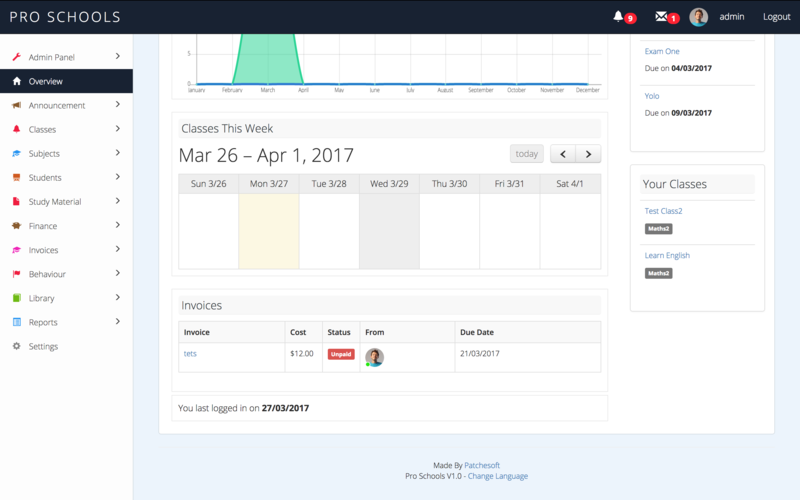 Manage your currencies and Invoice settings. Manage Custom Fields for Users. Supports any UTF-8 language and RTL languages! Four Themes: Basic, Titan, Dark Fire and Light Blue. Would you like to contribute your language files for others to use (including updated/new)? If so, drop us an email at patchesoft@gmail.com and we will happily give credit to your site/company in our Documentation files both offline and online. 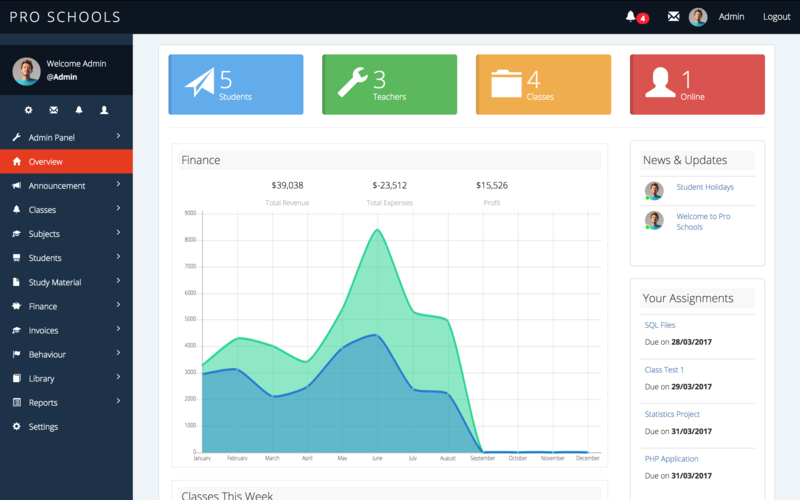 Create multiple Hostels, Hostel Rooms and even add bookings to keep track. Added Tool to Reset School options (classes, subjects, assignments, attendance). 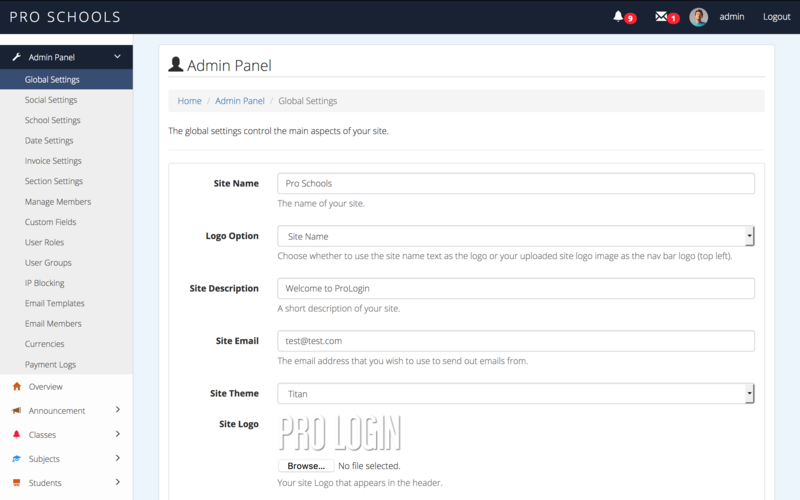 New Parent Management area; allows admin to add new parents/edit/delete them. Parents can have children assigned to them in Parent Management area. Each Class can now have it’s own grading system added. Assignments can now have a weighting score added to them, which will decide how much % the assignment is worth towards the final grade. Assignments can now have a max mark added to them. This is used to calculate the student’s grade based on the grading system for each class. Grades are automatically calculated when viewing User Submissions and Your Assignments area. Updated Custom Fields to allow you to select whether the fields are displayed in the School Report of a student. New School Report added to Students area. Can view overall grade, attendance, custom fields and more. View all student assignments for a specific class & user from the Class Student’s page.